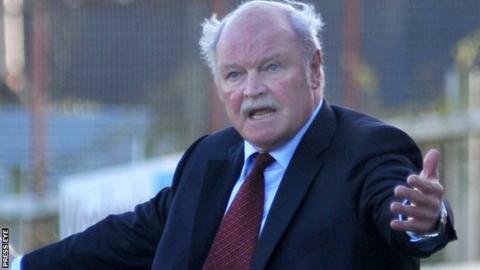 Portadown manager Ronnie McFall has called on his players to make amends for what he described as an embarrassing defeat by Coleraine. The Ports go to Ballinamallard on Saturday knowing they blew a chance to go top of the table against the Bannsiders last weekend. "It was our worst performance for a long time and I will be looking for a positive response," said McFall. "I think some players thought it would be easy. Our attitude was all wrong." But the veteran boss added: "We have been excellent overall this season and still sit only a few points off top." Darren Murray is suspended after being sent-off for a challenge on Coleraine's Adam Mullan. Portadown will have to cope without midfielder Michael Gault and striker Darren Murray as they serve automatic one-match bans after being sent-off last Saturday. Champions Cliftonville are back at the top of the Irish Premiership table having won four matches in a row. Tommy Breslin's men go to struggling Dungannon Swifts who have won just once in the league this season. However, Dungannon picked up a point away to Institute last Saturday which satisfied team boss Darren Murphy. Saturday's Irish Premiership clash between Glenavon and Linfield is the main commentary game on Radio Ulster's Sportsound. Joel Taggart will describe the action from Mourneview Park alongside former Glentoran manager Scott Young. The programme will have reports from the day's other top flight matches. "It gives us something to build on. Facing Cliftonville is difficult enough and at least we are not going into the game on the back of another defeat," said Murphy. "Cliftonville have turned the corner with wins over top sides like Crusaders, Linfield and Portadown. "We will have wide men and two strikers on the pitch and we will give it a go. We don't know any other way." Linfield go to second-placed Glenavon desperately needing a win following back-to-back Premiership defeats and Tuesday's County Antrim Shield exit at the hands of Crusaders. The Blues are down to fifth but manager Warren Feeney was remaining positive. "I know the fans are frustrated with the last few games but it is my job to pick up the players. I believe in them although we are still a work in progress," said the Blues boss. Linfield face a buoyant Glenavon whose 4-1 success away to Ballymena was their third league victory in succession. Crusaders, sitting in third place, take on bottom club Warrenpoint Town at Seaview. Warrenpoint's recent rash of red cards continued last weekend when they had Daniel Hughes and Ciaran Gargan sent-off in the 5-2 home defeat by Glentoran. The Glens, up to sixth after that Milltown victory, are at home to Ballymena United on Saturday. Coleraine are seventh having won four from five and will aim to keep that good run going when they take on Institute at the Showgrounds.